Elizabeth Bennet, the daughter of Mr. and Mrs. Bennet, has four sisters named Jane, Mary, Catherine, and Lydia. When Mr. Bingley, a rich and single man, rents a home near them, Mrs. Bennet immediately hopes that one of her daughters will marry him, so the family can gain some much needed money. Mr. Darcy, Mr. Bingley’s intimate friend, begins to become interested in Elizabeth. Because he is filled with pride, she does not return the feeling. Jane and Mr. Bingley quickly grow attached to each other, but Mr. Bingley’s sisters do not approve. They wish that Mr. Bingley would marry someone of a higher class. Also, Mr. Darcy believes that Jane does not actually have any feelings for him. Therefore, Mr. Bingley is convinced to depart with his sisters to London, leaving Jane behind, heartbroken. Meanwhile, Elizabeth hears countless rumors of horrible acts Mr. Darcy had committed, causing her to greatly dislike him. Suddenly, Mr. Darcy himself arrives, declaring his love for Elizabeth. She is stunned, and rejects him impolitely, ignoring his efforts to defend himself from her insults. Afterward, she receives a letter from him explaining how he was wrong about Jane and why the rumors of him are false. Elizabeth suddenly realizes that she had been prejudiced against Mr. Darcy, and her hatred vanishes, replaced with shame. When Lydia unexpectedly runs off with a disliked officer, Mr. Darcy tries to save the family reputation by finding them, and Elizabeth begins to fall in love with him. 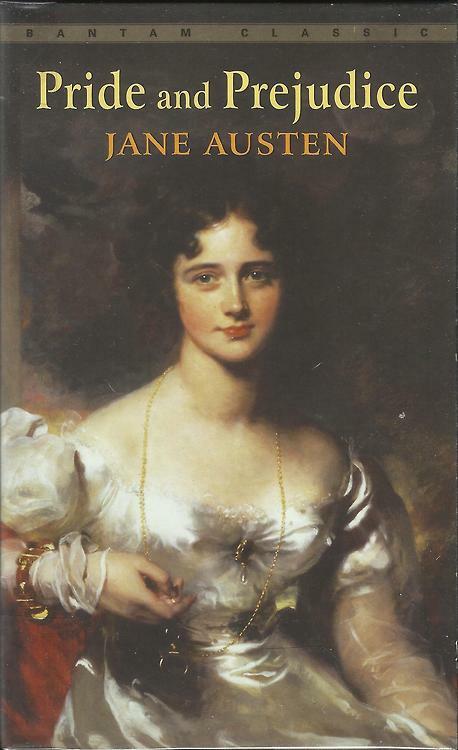 Jane Austen enhances her story with strong and descriptive words from the 1800s. The first couple chapters were slightly difficult to comprehend because of all the introductions of the new characters, but as the story progressed, my absorption in the plot increased rapidly. The author expresses her talent of weaving numerous complicated events together to form a conflict, and her writing style is truly exceptional. For example, the famous first sentence of Pride and Prejudice acknowledges that every man who has a great fortune must long for a wife. This sentence gives a brief overview of the entire book, for Mr. Darcy and Mr. Bingley, who are both extremely rich, must want a wife. The characters all have distinctive personalities that are unique in their own ways. I would recommend this book to older middle school students and young high school students because of the complex plot and difficult words. Although I occasionally struggled through parts of this book, I definitely do not regret choosing it because I have enjoyed reading this remarkable love story that differs greatly from modern romance novels. I would give this an eight out of ten stars. 1. Why does Mr. Bennet favor Elizabeth over his other daughters? 1a. Mr. Bennet favors Elizabeth because he feels that she “has something more of a quickness than her sisters.” (7) He believes that his other daughters are more foolish and ignorant, while Elizabeth is more clever and witty. 2. Why does Mrs. Bennet insist Jane on going on horseback to see Mr. Bingley? 3. What reason does Mr. Wickham believe is the cause of Mr. Darcy’s hatred toward him? 4. Who has the power to claim Mr. Bennet’s house after he passes away? 5. What causes Elizabeth to be upset at the Netherfield ball? 6. What causes tension between the Bennets and the Lucases? 7. What are Mrs. Gardiner and Elizabeth’s opinions on Mr. Wickham’s sudden interest in Miss King? 7a. Mrs. Gardiner believes that Mr. Wickham took interest in Miss King only after the death of her grandfather “made her the mistress of [his] fortune.” (153) However, Elizabeth disagrees because he had taken interest in herself, who was equally poor as Miss King before she gained her large fortune. 8. During Elizabeth’s stay at the Collins’, where is her favorite place to go, where she feels like she can escape Lady Catherine’s constant curiosity? 9. What does Colonel Fitzwilliam tell Elizabeth that makes her feel indignant and furious toward Mr. Darcy? 9a. Colonel Fitzwilliam explains how Mr. Darcy prides himself in “[saving] a friend from the inconveniences of a most imprudent marriage,” (184) referring to Jane and Mr. Bingley. 10. What are Jane’s opinions on Elizabeth’s rejection to Mr. Darcy’s proposal, and how does her reaction reveal more of her characteristics? 11. What is Elizabeth’s first impression of Miss Darcy, who Mr. Wickham claimed to be cocky and full of herself? 13. Why does Elizabeth run out of the room during Lydia’s wedding? 14. What does Lady Catherine tell Elizabeth during her unexpected visit? 15. What are Mr. and Mrs. Bennet’s reactions to Elizabeth accepting Mr. Darcy’s proposal? 15a. At first, they are both extremely shocked, for they were certain that Elizabeth had “always hated him.” (363) However, after they recover their composure, both Mr. and Mrs. Bennet are overjoyed.